So for the last few game days, I’ve moved away from my regular brand of BBs to test 2 BB lines from Valken – the Valken Tactical BBs and the Infinity BBs. First, we’ll look at the Valken Tactical BBs, which are Valken's premium line of BBs that come in both non-bio and bioplastics in a variety of weights, as I exclusively play CQB in the winter months I opted for the non-bio in a 0.25g weight! 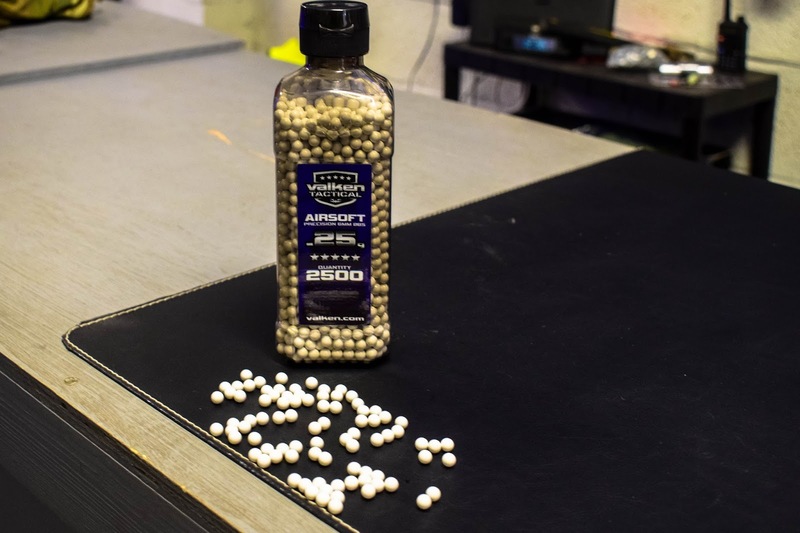 Realistically there’s not much to say about BBs – they’re white, spherical and are made of polymer for use in spring/gas/electric airsoft weapons. So what we need to look at is how uniform they are in appearance and how they feed! On the bottle it says that their diameter is Diameter: 5.95mm +/- .01 tolerance - perfect. For a visual inspection, I poured a fair few BBs out onto my workbench – they’re all uniform shape and size, with no visual differences, and from the look/feel of them you can tell that they have been highly polished. There are no seams either. I tested the Valken Tactical BBs in an AEG, a GBB, and a HPA gun as well as using the Valken RMAG mid-caps and the results were pretty impressive - the BBs fed well in all platforms, with no jams or misfeeds, there were also no breakages when hitting hard surfaces which is great, especially for those who wear mesh goggles. Overall, I would say that the performance rivalled my usual brands of BBs. 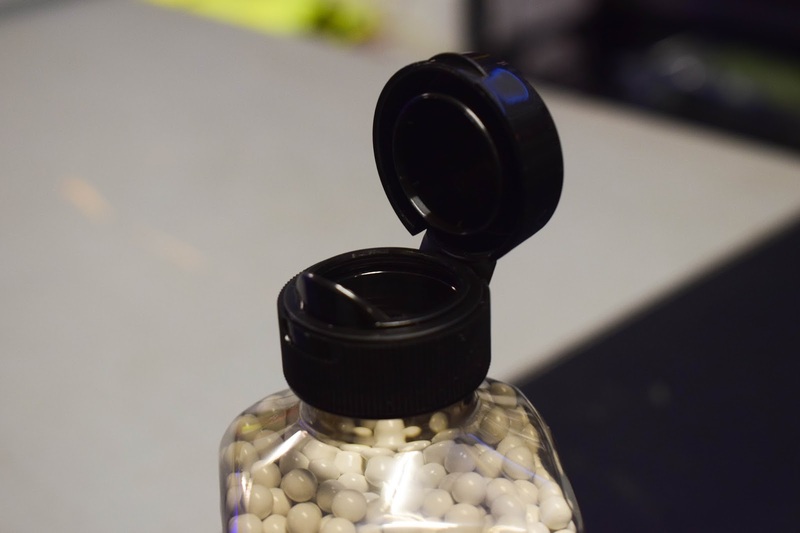 One thing I like about the Tactical line is that the BBs come in a Valken branded bottle that has square sides to prevent ALL of the beebs rolling out if the container is ever on its side, another nifty little feature of the bottle is the pouring cap – the shaped pouring cap makes it SO much easier to pour your BBs into your speedloaders or high caps. 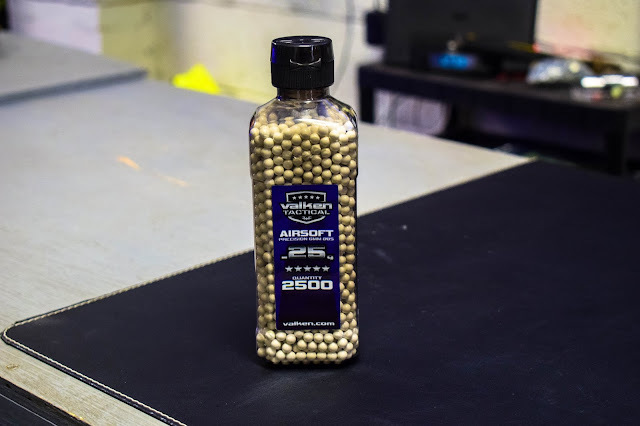 The tactical line of BBs retail for $7.49 for 2,500 BBs on the Valken website here, which for us over the pond is around £6 – for a .25g weight of BB, this is super affordable. Next up is the Infinity Line! This is Valken's economical line of BBs, they offer the player more bang for their buck with a lower price per pack - $7.49 for a 1 kg bag (which again is around £6 for the Brits but is a huge quantity). These are available in .20g and .25g weights in non-bio plastic. On the pack, it says that their diameter is 5.95mm BB +/- .01mm and that they meet or exceed the requirements of ASTM Standard F2679 – awesome! Again on inspection, the BBs were seamless BB's with no size differences or abnormalities and were highly polished. 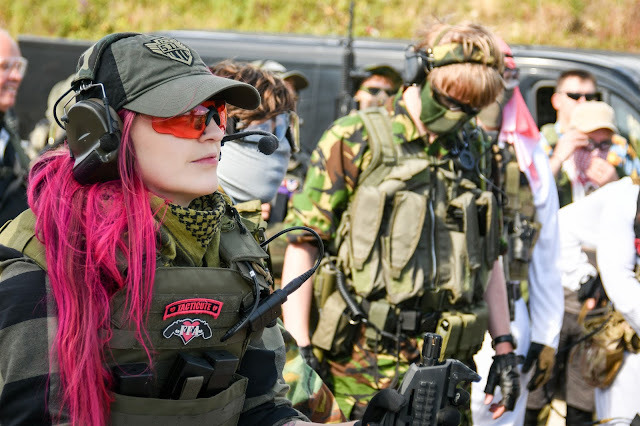 I tested these BBs in the same AEG, GBB shotgun and the HPA platform as the tactical line and the results were the same. Consistent and accurate, just what we like to see! 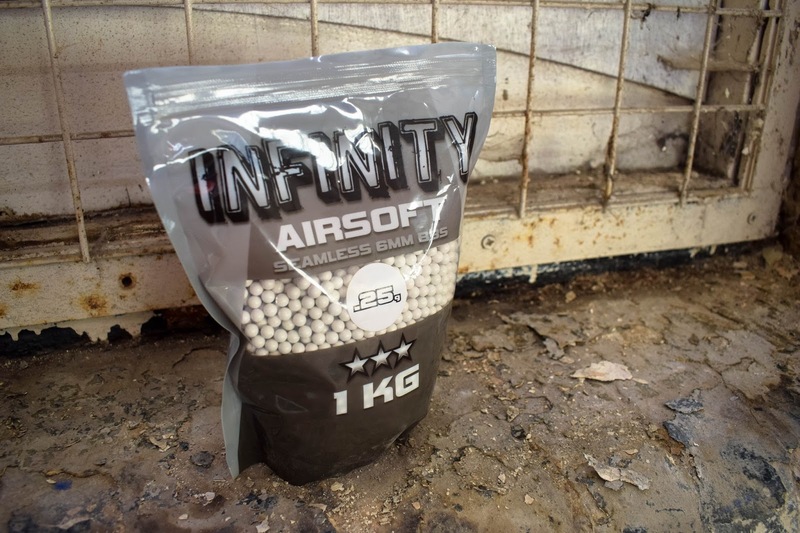 The only thing I’m not keen on in regards to the infinity line is the packaging – pouring from bags is more difficult than from a bottle and you have to be careful not to knock over the bag when it's open as you’ll be in for losing a fair few BBs!